Leo is one of the constellations of the zodiac. Its name is Latin for lion. Its symbol is ( ♌). Leo lies between dim Cancer to the west and Virgo to the east. Leo contains many bright shining stars, such as Regulus (also called α Leonis); the lion's tail, Denebola (also called β Leonis); and γ1 Leonis (also called Algieba). Many other fainter stars have been named as well, such as δ Leo (Zosma), θ Leo (Chort), κ Leo (Al Minliar al Asad), λ Leo (Alterf), and ο Leo (Subra). Regulus, Al Jabbah, and Algieba, together with the fainter stars ζ Leo (Adhafera), μ Leo (Ras Elased Borealis), and ε Leo (Ras Elased Australis), make up the pattern known as "the Sickle". These stars represent the head and the mane of the lion. The star Wolf 359, one of the nearest stars to Earth (7.78 light-years), is in Leo. The carbon star CW Leo (IRC +10216) is the brightest star in the night sky at the infrared N-band (10 μm wavelength). Leo contains many bright galaxies, Messier 65, Messier 66, Messier 95, Messier 96, Messier 105, NGC 3521 and NGC 3628 are the most famous. The first two are part of the Leo Triplet. The Leo Ring is a cloud of hydrogen and helium gas. It is found in orbit of two galaxies found within Leo. Many civilizations over thousands of years have portrayed the constellation of Leo as a lion. One theory for this is that the Sun was among its stars in Midsummer. This was the time when the lions of the Egyptian desert left their usual home for the banks of the river Nile. There they could find relief from the heat in the water. The Roman writer Pliny the Elder wrote that the Egyptians worshipped the stars of Leo. He says this is because the Nile would overflow with water at the same time as the Sun entering into the constellation. In Egypt, the Ramesseum (the memorial temple of Pharaoh Ramesses II) at Thebes mentions Leo in the inscription on the wall. On the planisphere of Dendera Leo is shown standing on an outstretched serpent. The Persians called Leo Ser or Shir; the Turks, Artan; the Syrians, Aryo; the Jewish, Arye; the Indians, Simha ; all meaning a lion. In Babylonian astronomy these stars were called UR.GU.LA - the 'Great Lion'; the bright star, Regulus, that stands at the Lion's breast also had distinctly regal associations as it was known as the King Star. In Greek mythology, it was identified as the Nemean Lion which was killed by Hercules during one of his twelve labours, and after that put into the sky. The Roman poet Ovid called it Herculeus Leo and Violentus Leo. Bacchi Sidus (Star of Bacchus) was another of its titles, the god Bacchus always being identified with this animal. However, Manilius called it Jovis et Junonis Sidus (Star of Jupiter and Juno). Early Hindu astronomers knew it as Asleha and as Sinha, the Tamil Simham. As of 2002, the Sun appeared in the constellation Leo from August 10 to September 15. In tropical astrology, the Sun is considered to be in the sign Leo from July 23 to August 22. In sidereal astrology the sun is said to be in Leo from August 16 to September 15. Leo, with Leo Minor above, as depicted in Urania's Mirror, a set of constellation cards published in London c.1825. H.A. 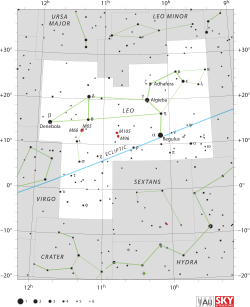 Rey has suggested an alternative way to connect the stars, which shows a lion walking. The stars delta Leonis, gamma Leonis, eta Leonis, and theta Leonis form the body of the lion. The stars gamma Leonis, zeta Leonis, mu Leonis, epsilon Leonis, and eta Leonis form the lion's neck. The stars mu Leonis, kappa Leonis, lambda Leonis, and epsilon Leonis form the head of the lion. Delta Leonis and beta Leonis form the lion's tail: beta Leonis, also known as Denebola, is the bright tip of the tail with a magnitude of two. The stars theta Leonis, iota Leonis, and sigma Leonis form the left hind leg of the lion, with sigma Leonis being the foot. The stars theta Leonis and rho Leonis form the right hind leg, with rho Leonis being the foot. The stars eta Leonis and alpha Leonis mark the lion's heart, with alpha Leonis, also known as Regulus, being the bright star of magnitude one. The stars eta Leonis and omicron Leonis form the right front foot of the Lion. ↑ H. A. Rey, The Stars – A New Way To See Them. Enlarged World-Wide Edition. Houghton Mifflin, Boston, 1997. ISBN 0-395-24830-2.